Did you know that there are over 300 renditions of the song “Hallelujah” by Leonard Cohen? 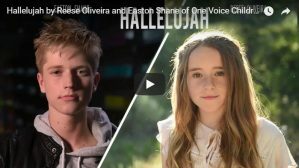 In this music video, Reese Oliveira and Easton Shane sing the Christian-based lyrics, as performed by Jake Hamilton. These two LDS musicians are part of the One Voice Children’s Choir. Reese Oliveira is a 13-year-old vocalist and Easton Shane is a 15-year-old guitarist. Here is a list of other member-created videos we have shared. If you find other videos you think we should share, please post a comment below. Let’s raise a cry, let’s raise a hallelujah! My offering is a broken hallelujah!